Truckee Town Council candidates Carmen Carr, Morgan Goodwin, Anna Klovstad, Richard Ludke, David Polivy, Suzie Tarnay, Walterscheid took questions about access to affordable housing, grocery store and other development projects, as well as cannabis regulation, at a forum Wednesday night. 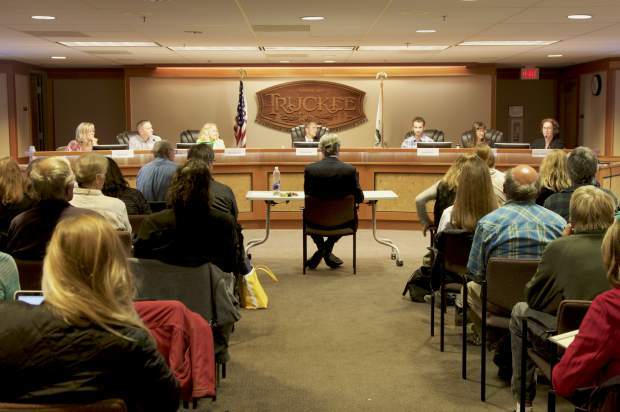 Seven candidates seeking a seat on the Truckee Town Council took questions about access to affordable housing, grocery store and other development projects, as well as cannabis regulation, at a forum Wednesday night. With an estimated 12,000 housing units needed to accommodate the future workforce, according to a 2016 Tahoe Truckee Housing Needs Assessment, all agreed something should be done immediately. Candidate Suzie Tarnay suggested increasing in lieu housing fees, as well as updating the inclusionary housing ordinance to require developers to include more affordable housing units in their projects. Both Tarnay and Richard Ludke were proponents of keeping the in lieu housing fees out of the general fund, while Ludke said he would support businesses that can provide workforce housing for their own employees. Morgan Goodwin and David Polivy suggested higher density housing in the downtown area closer to transit. Anna Klovstad suggested a possible reduction in building permits while Chelsea Walterscheid said she would seek to hire a full-time employee focused solely on solutions to the problem. “We need to make sure that when developers come to the area they are excited about building affordable housing,” said Carmen Carr. Along with addressing the housing crisis candidates were asked how they would maintain a small-town atmosphere while Truckee is on the cusp of another growth surge. Candidates also addressed the approval of multiple grocery stores. Goodwin said that the issue was the hardest thing to deal with while serving on the town council. “This needs to be left to zoning restrictions and, this is why the General Plan Committee is so critical for our future,” said Klovstad, adding there is no need to fear change. Ludke said he believes in protecting the rights of property owners and allowing them to build what they want with their property, but the town could take a better look at zoning regulations to find a better location for businesses. The question of where candidates stand on cannabis regulation in Truckee brought forth unique solutions to other issues the town faces. “I’m very much in favor of commercial cannabis production, and cultivation in order to solve some of the residential issues we have before us,” said Polivy. He suggested that by providing outdoor spaces for growers, those buildings could then be used for housing, which was followed by laughter from the audience. “I’m being dead serious,” he said. Tarnay said cannabis should be regulated and taxed the same as alcohol. One way the tax could be used is to fund the construction of a new library, which community members have been advocating for, with what she dubbed a “weed to read” program. Goodwin said he was in favor of allowing cannabis storefronts. “I’m very confident we can do it right and keep it classy,” he said. Hannah Jones is a reporter for the Sierra Sun. She can be reached at 530-550-2652 or hjones@sierasun.com.